A backdrop built with The CUBE System. This is also available as a kit. 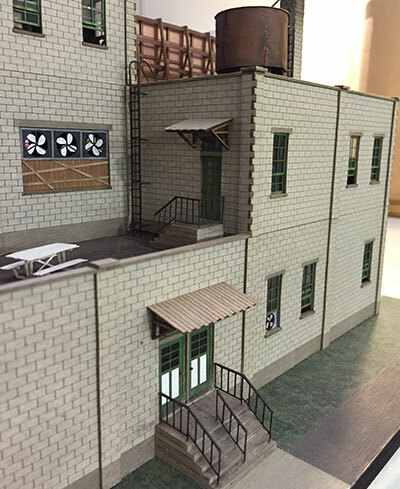 GCLaser's modular building system makes it simple to design and build your own HO Scale backdrops, factories, warehouses, and small office structures. Check out the Cube System. It offers tons of options for designing and creating structures, without the effort and time required to scratch build them. You decide which of the laser cut components to use; then glue the components onto the pre-cut and tabbed cubes. Multiple cubes may be joined horizontally or vertically; allowing you to build a structure as small as 2-1/2" x 2-1/2"; or as large as you want. The CUBE System is comprised of: CORES, FACES, and ADD-ONS. The "cores" are the structure of the building. 45 styles of "faces" are available in cinder block, concrete, and brick; no painting required. 19 different "add-ons" complete your building. These include roofs, chimneys, stairs, parapets, corns, ladders, and more. The faces and add-ons are available separately; allowing for many design options. Free design templates are available to help you get started creating your structures. Find out more about The Cube System on GCLaser's website. GCLaser has been creating Model Railroad Structure and Detail Kits since 2003. The Genoa City, Wisconsin-based company makes laser-cut and laser-etched craftsman structure kits and details such as laser cut shingles and truck beds. Rich shares his knowledge and experience of assembling and detailing GCLaser's extensive line of products in this blog. ©2014 GCLaser Innovations. All rights Reserved. Simple theme. Powered by Blogger.